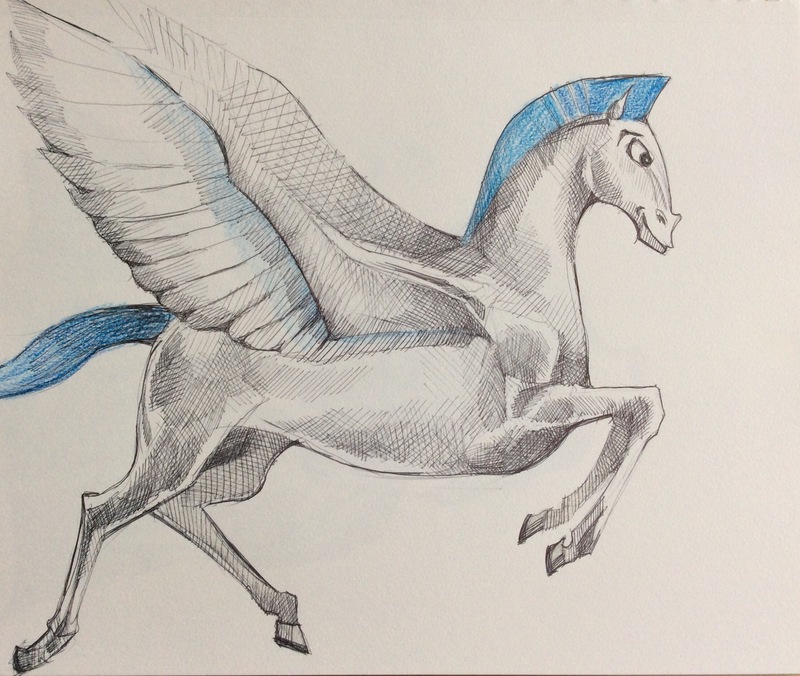 I think my love for fantastical and magical creatures all began with Pegasus. Growing up, Hercules was one of my favorite movies. Undoubtedly, this was because of Herc’s trusted companion, the winged-horse. I was incredibly inspired by this character and used to spend a lot of time trying to draw the horse for myself. Always having remained my favorite Disney character, I even came home from my first Disney World visit with a stuffed baby-Pegasus. Aside from watching Hercules, I used to read the story of “Bellerophon and Pegasus” repeatedly out of a children’s treasury of Greek mythology. I used to stare of the cover of the book and hope that one day I would be talented enough to depict winged-horses as well as the book’s illustrator. I used to trace the image over and and over again, hoping to create muscle memory and teach myself to draw so well. I’m happy to say that this wish did come true, and I have become a much better artist than I was at age 8 (thank God). That being said, this post isn’t about refined art skills or photo-realistic depictions of horses, but rather about paying homage to the character that inspired me so much as a child and lead me on an artistic path that I am grateful for. So here’s to you Pegasus! And thank you to The Walt Disney Company for sparking my imagination as a child. Were it not for the fantastical worlds I consumed via the media, I don’t know where I’d be today. (Probably drawing something dreadfully boring…like flowers. *shudder*).